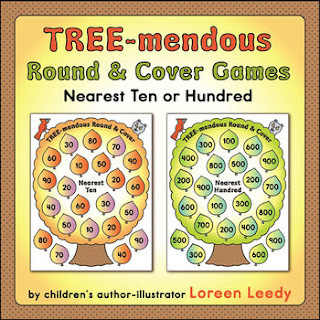 Rounding Games to the Nearest 10 and 100: Kiddos will review how to round to the nearest ten or hundred with these "TREE-mendous Round & Cover” math games. Instead of rolling dice, players pick Number Cards with digits from 1–9 and arrange them on the recording sheet to make a 2 or 3-digit number. After writing the number, they round it with the help of the enclosed Rounding Charts. Then players cover the matching number on the game board. The first to cover all the spaces is the winner! For a faster game, two players can share the same board. Students love playing games and can practice Common Core State Standard 3.NBT-A.1: Use place value understanding to round whole numbers to the nearest 10 or 100. Great for math centers or fast finishers! Choose from game boards in fall colors, spring greens, or black and white. Use with Tree, Plant, Autumn, Spring, Forest, Nature, Camping, or other outdoor themes. This packet is part of a Fall Rounding Bundle at this link.See my Rounding Mystery Pictures at this link. Here are Color-by-Rounding Fall Fun Pictures. Click here to see all my Math resources. So glad you could stop by!